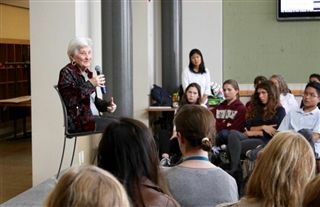 On Monday, May 16th, Holocaust survivor Rose Schindler shared her personal account of despair and courage with Pacific Ridge Upper School students. Schindler, age 86, spent four months in Auschwitz as a young teenager. Schindler was forced to scavenge for food and take extraordinary risks to survive. Eventually, she and her two older sisters were sent to an ammunition factory where they worked tirelessly until Russian soldiers came to liberate them. Schindler's father, mother, older brother, and three younger siblings did not live to see the war end. Schindler says she chooses to share her story so that the world will remember those who are gone and the horrors that she, and millions of others, experienced.